Thomas Atkinson, 1807-1881 Christian Duty in the Present Time of Trouble: a Sermon Preached at St. James' Church, Wilmington, N.C., on the Fifth Sunday After Easter, 1861. 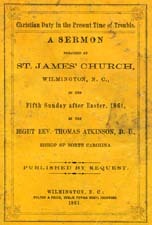 Christian Duty in the Present Time of Trouble: a Sermon Preached at St. James' Church, Wilmington, N.C., on the Fifth Sunday After Easter, 1861. Wilmington, N.C.: Fulton & Price, Steam Power Press Printers, 1861. Secession -- Southern States -- Sermons. Sermons, American -- North Carolina. Wilmington (N.C.) -- Church history -- 19th century.